House fly lays its eggs usually in masses on organic matter such as manure and garbage. It looks like a heap of 120 – 130 eggs. Hatching occurs within a few hours. The larvae are slender, white, legless maggots with broad back end and a narrow head. These develop rapidly, passing through three instars. The young larvae burrow into the breeding matter. As they need oxygen, these survive only where air circulation is possible. If the breeding medium is very wet they can live merely on its surface, however in drier mediums they may penetrate to a depth of several centimetres. The time needed for development varies from a minimum of three days to several weeks. It depends upon the species, the temperature and the type and quantity of food available. After the feeding stage is completed the larvae migrate to a drier place and burrow into the soil or hide under objects offering protection. They then form dark maroon capsule-like pupae. Inside these, the transformation from larva to adult takes place. This usually takes 2–10 days, at the end of which the fly pushes open the top of the case and works its way out and up to the surface. As soon as the fly emerges, it spreads its wings and the body dries and hardens. The adult fly is grey, 6–9mm long and has four dark stripes running lengthwise on the back. After a few days, the adult is capable of reproduction. Under natural conditions an adult female rarely lays eggs more than five times. 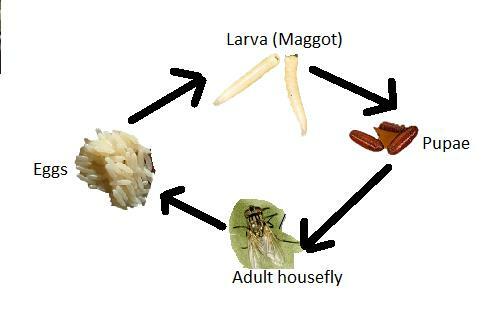 Both male and female flies feed on all kinds of human food, garbage and excreta, including sweat, and on animal dung. •	Park K. Environment and Health. In: Park’s Textbook of Preventive and Social Medicine, 24th ed. Jabalpur, India: M/S Banarasidas Bhanot Publishers; 2017. •	Keiding J. Houseflies. In: Vector Control: Methods for Use by Individuals and Communities. Geneva, Switzerland: WHO; 1997.